Castles are cool. From an early age this is something we just sort of know, probably because it was drummed into us through fairy tales. And we still just sort of know it, helped by the fairy tales they make for grown-ups: Game of Thrones, Meghan Markle, that sort of thing. These islands, and this region, are littered with the things, in various states of repair. They’re fun to visit, but the idea of ever owning one is not one that many of us, as grown ups at least, spend much time thinking about. Dr Stuart Madnick, a professor of information technology at MIT, apparently did spend time thinking about it. 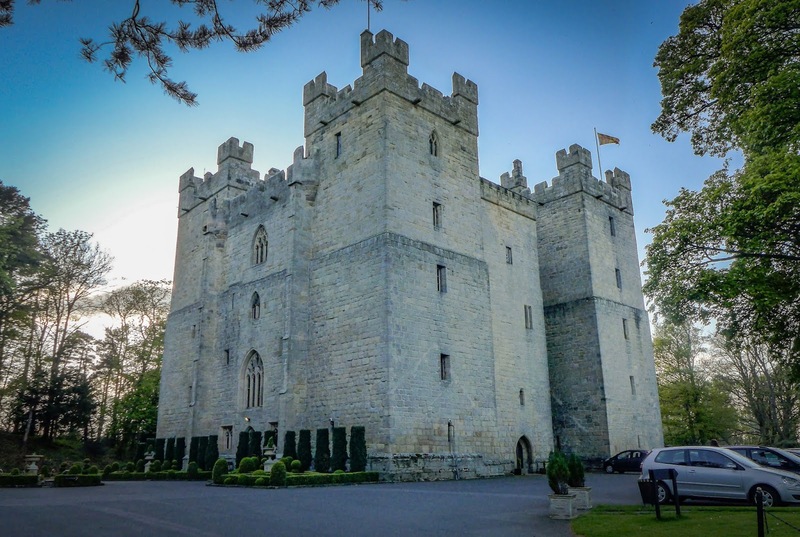 In 1985, a friend spotted an advert for Langley Castle and, aided by a favourable exchange rate, Madnick snapped it up and set about transforming the place into a luxury hotel. Which means that while neither you nor I are likely to possess a castle of our own, we can at least stay and eat in his. Set in a serene woodland estate just off the A69, Langley is a perfectly formed H-shaped lump, with towers at each corner. 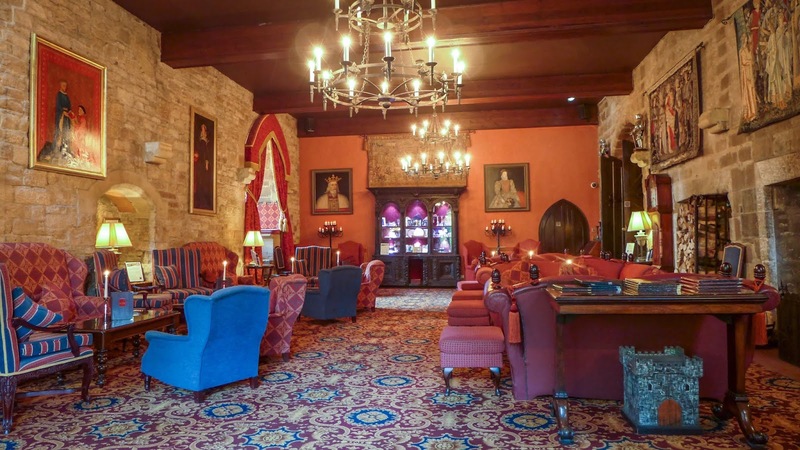 It ticks all the boxes on the castle check-list: thumping great front door, suits of armour that greet you near reception and tapestries in the upstairs lounge. Short of pouring boiling oil over you as you enter, or having a bard present the menus, they’re going all out to create the impression that this ain’t just your regular hotel, and fair enough. I’d actually eaten there once before, but at a friend’s wedding, where the food was nothing to write home about – pretty indifferent banquet fare. As a result I'd put off making another trip up the Tyne Valley to sample its regular restaurant for nearly ten years. I regret that now. Because we wanted to give the place a proper second chance, we decided to push the boat out and give the £65 tasting menu a spin, although certainly not for any of the cringe-worthy “10 reasons to eat from our taster menu” listed on their website (reason 7: “Because each dish brings something new, the tasting menu creates lots of talking points that are both perfect ice-breakers for those doing business or on a first date, and also brilliant ways of keeping the conversation flowing, with no empty and awkward pauses.” Christ...). No, we chose it because friends had recommended head chef Mark Percival’s food, and we wanted to give him his best shot. And because we love food and we’re greedy. I didn’t see those reasons listed. Ordering should have been straightforward, but our attempts to sub out a dish – much to my chagrin Mrs Diner doesn’t do game - resulted in an awkward back and forth with a slightly haughty waitress before it turned out that this was doable. 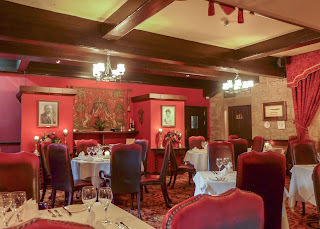 After some very poor snacks - I bet jousting knights never dined on mini rice cakes - we headed downstairs to the Josephine restaurant, all candles, dark wood and bulls-blood reds. Given the privacy of our own alcove in the seven-foot thick walls of the castle, and ably looked after by the restaurant manager, the evening passed - mostly - very enjoyably. 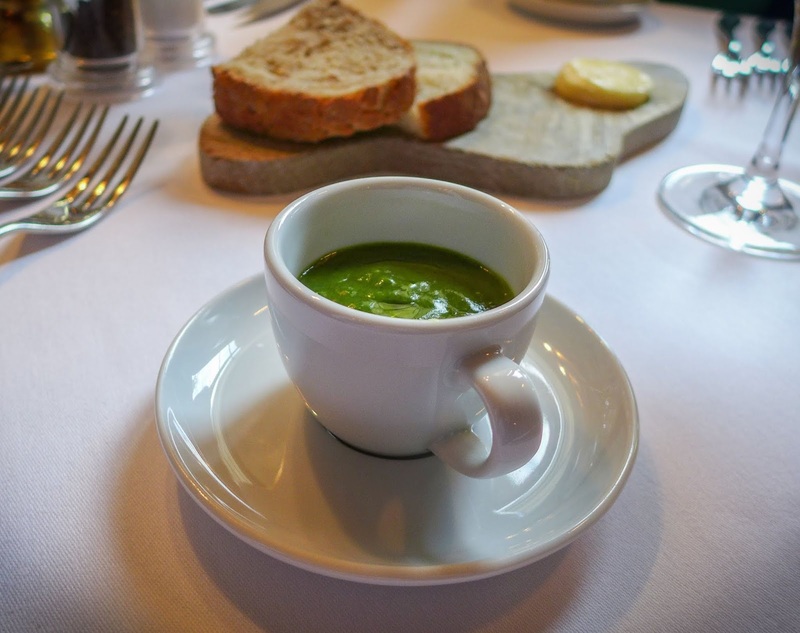 Excellent crusty bread was baked on site, and was just the thing for the pair of soups that got us out the starting blocks. 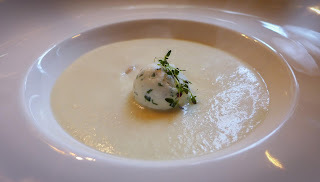 An amuse of bang-seasonal wild garlic veloute was followed by our first course proper of white onion. The dense richness of the latter had us noisily scraping away at our bowls, but was kept in check by a ball of tangy goats cheese and some lightly pickled onions. 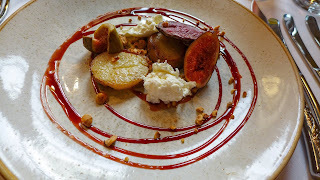 My dish of pigeon with figs, burrata and hazelnuts was solid cooking, the breast of the bird the same deep red as the furnishings. However Mrs Diner’s replacement seared foie gras was superb, the piece of lobe as rich in flavour as it was light in texture. 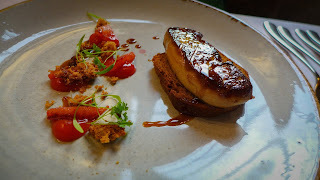 Blood oranges and spiced bread were excellent accompaniments for this little piece of luxury. 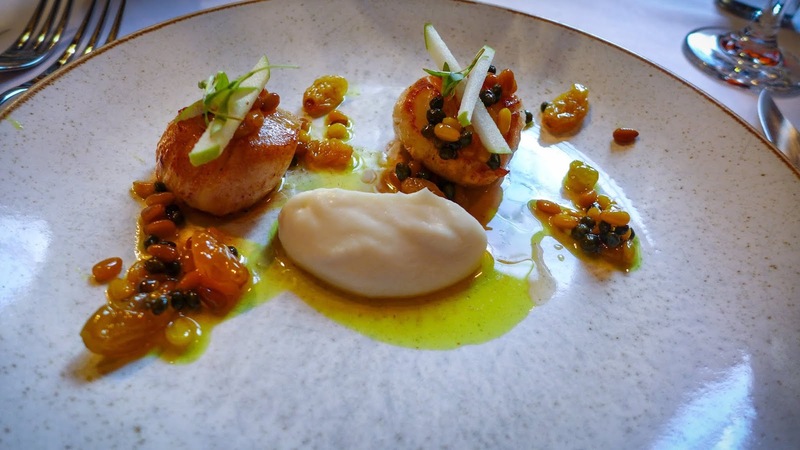 Next up, some genius: a brace of leviathan-sized scallops were paired with juicy golden raisins and punchy little capers in a curried oil, with cauliflower purée, toasted pine-nuts and raw apple slivers rounding out a dish that was superb in both intent and execution. Freshness, depth, contrasts of texture; it was all there, loveliness given form. All of which made it quite a shock to receive such a dud of a last savoury dish. 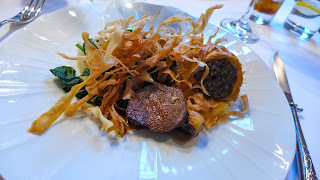 Thin discs of venison loin were overcooked, one of mine criminally so, while a haggis sausage roll, which sounded great on paper, was hewn of poor pastry and a filling so tight as to seem that it hadn’t been properly cooked. The blizzard of parsnip crisps that obscured these woes tasted acrid, is if they had either caught, been fried in too-old oil, or both. Thankfully pudding was good enough to banish the memory of this unwanted interloper. 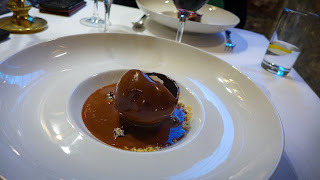 Inside a melting chocolate sphere was hidden a fine cherry parfait, the whole business moated by a beautifully light yet powerful chocolate “soup”. I’m a sucker for the flavours of black forest gateaux, so this went down a storm. With typically useless timing, it transpired that chef Percival (formerly Bouchon Bistrot and Close House) had actually left the business after the breakfast shift earlier that day. I hear that he is moving onto something new in Whitley Bay’s Spanish City - good luck to him. Despite the boss being away, I decided I would still write this review up, partly to give credit to his sous chef and partly because Langley doesn’t seem the type of place where a new chef would want to be able to make radical changes to what seems to be a good formula. Time will show if I’m wrong. 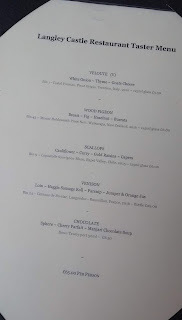 Service was a maybe a bit starched for my own personal taste, but in this environment you can almost forgive it. Almost. Having seven courses worth of cutlery on the table waiting for us looked, frankly, a bit daft. Mrs Diner had nowhere to put her elbows. If this was meant to impress us, then hearing a waitress’s shriek of ”there’s a fly in the bread!” coming from the open back-kitchen door as we took a wander round the grounds did the exact opposite. Not a good look at all. Mostly though, Dr Madnick - who was actually dining in the restaurant the night of our visit - has reason to be rather proud of what he, his family and his long-term staff have achieved at Langley. 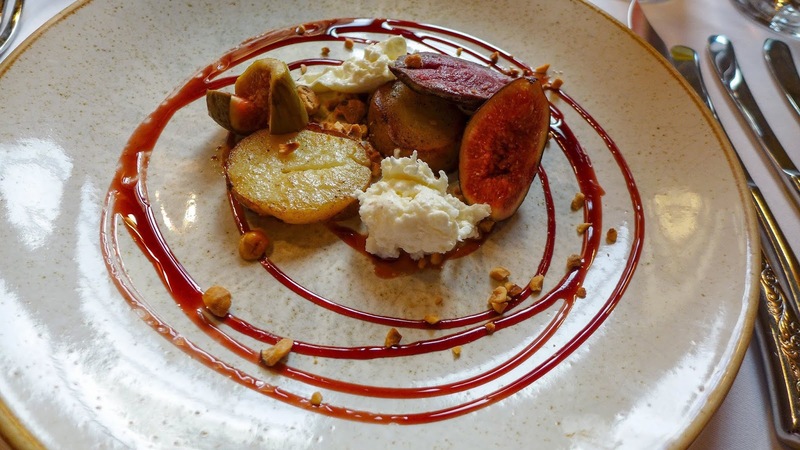 For a singular dining experience, within striking range of Newcastle, it’s hard to beat. 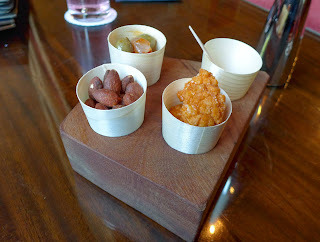 I’ve had some woeful AA-rosetted country hotel meals of late and this absolutely wasn’t one of those. Certainly keep an eye on whom they appoint as the next head chef, but there is already some proper talent in this kitchen. Highly recommended for now.